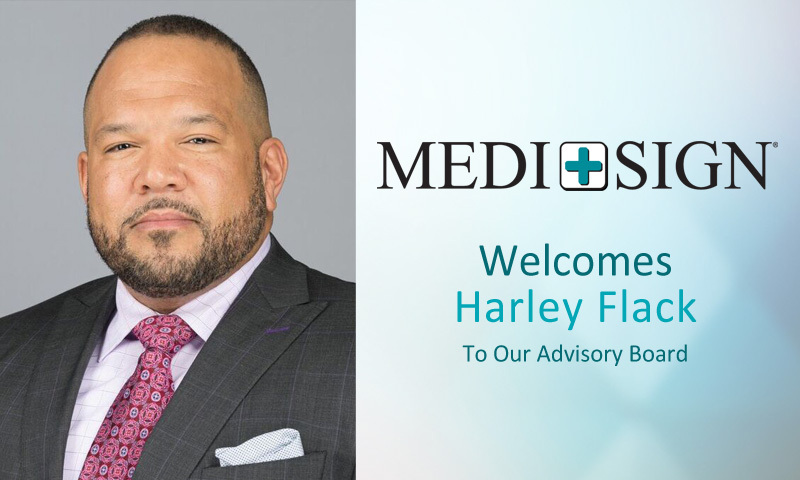 MEDI+SIGN is honored to announce Harley Flack as a new Advisory Board member to assist in the company’s healthcare communications and technology endeavors. July 25, 2017 – Smithsburg, Maryland — MEDI+SIGN, a healthcare technology company that provides automated communication to the patient’s bedside, would like to officially welcome Harley Flack, CEO of FlackAttack Ventures to the MEDI+SIGN Advisory Board. “Harley offers a strong presence on the board with strategic thinking and leadership experience that brings the right kind of expertise for the growth of MEDI+SIGN,” says David Linetsky, Founder, and CEO of MEDI+SIGN. Mr. Flack, the founder of FlackAttack Ventures Incorporated (FAV), is a dynamic and mindful thought leader and business operator. He is an impressive innovator in strategy, process improvement, acquisitions, ethics, networking, financing and capital strategies. He is the founding partner and an active Private Equity Investor and holds the position of Executive Operating partner for the investment portfolio. He brings to MEDI+SIGN the expertise in organizational development, government strategies, procurement strategies, sourcing, change methodologies, green business solutions, and strategic planning. He has collaborated with senior leadership of more than 200 Fortune 500 companies creating measurable results in diverse areas over the last 25 years. “As a seasoned investment professional with over 30 years in Finance and Executive Leadership, it is rare having an opportunity to align with a strong, growing company gathering momentum, recognition and creating excitement in the health sector,” says Mr. Flack, on being named to the advisory board. Mr. Flack has worked with MEDI+SIGN for the last three years and has been excited to see the business migrate from concept to consumer with the most recent adoption by St. Luke’s Miners Hospital. In addition to his role as an Emeritus member of the Annapolis Symphony Board and formerly serving as Chairman, Mr. Flack has also served on the Executive Board of Directors for the Community Foundation of Anne Arundel County and is presently a Board member for CFG Bank. He attended the University of New England, Howard University and the University of Maryland for Graduate Students. For more information, contact MEDI+SIGN at our website: www.medisigndisplays.com, or by phone (301-790-0103).